The Hutchins Center for African & African American Research presents Marian W. Edelman with the W.E.B. Du Bois Medal at Sanders Theater on Wednesday afternoon. Former U.S. Attorney General Eric H. Holder, Jr., hip-hop artist Nasir “Nas” Jones, and seven others received the W.E.B. Du Bois Medal—Harvard’s highest honor in the field of African and African American Studies—before an enthusiastic crowd in Sanders Theatre on Wednesday. In addition to Holder and Nas, this year’s recipients included Marian Wright Edelman, founder and president of the Children’s Defense Fund; Mellody Hobson, president of Ariel Investments; Carrie Mae Weems, a photographer and artist; Charlayne Hunter-Gault, a civil rights pioneer and journalist; and boxing legend Muhammad Ali, who was honored in absentia. 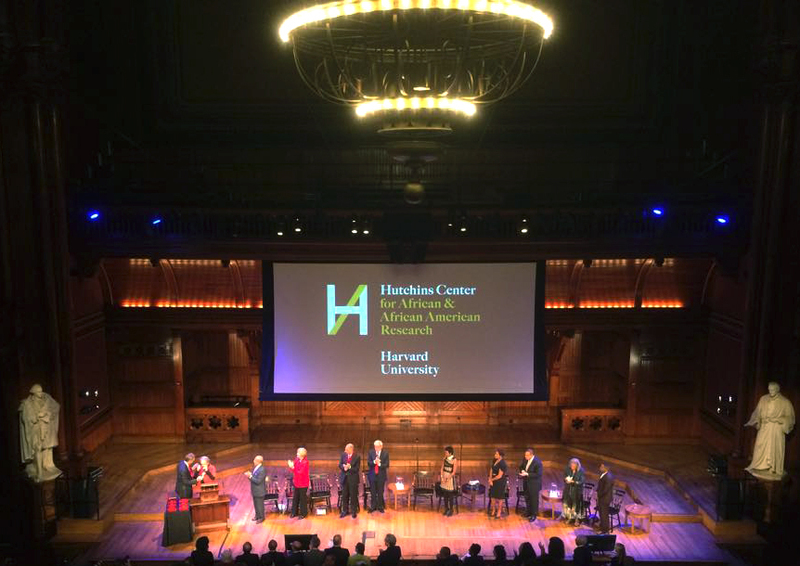 Richard D. Cohen and Ethelbert J. L. Cooper also received the award in recognition of their donations to the Hutchins Center for African and African American Research. University President Drew G. Faust, Dean of the Faculty of Arts and Sciences Michael D. Smith, and Harvard Law School Dean Martha L. Minow were among its presenters. Between boisterous bouts of applause, the award recipients shared advice, stories, and humor throughout the evening. Holder, the first medal recipient, recalled his work with the Obama Administration making progress in “the fight for LGBT rights, the desire to reform our penal justice system, and ensuring every person in the nation has the right to cast a ballot unimpeded.” Edelman, meanwhile, called for America to “invest in all of its children,” and Nas spoke about the role of young people. And Weems, at a loss for words, simply said, “What an honor. I am just…” and kissed her medal to chuckles from the audience.